Manifesto walks a fine line between the art house circuit and the museum. The resulting feature began life as a 2015 installation by visual artist Julian Rosenfeldt and Cate Blanchett. Its purpose is to restore the original shock, boldness and honesty of various manifestos – political, literary, cinematic, social, etc. 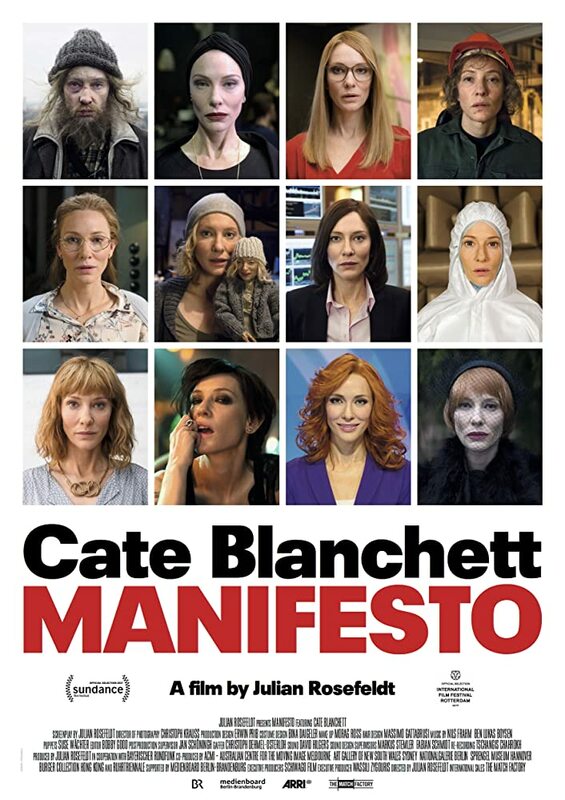 To achieve the goal of restoring radical, epoch altering energy to words that have, for better or worse, become part of status quo culture, Cate Blanchett plays thirteen wildly different “manifesto readers” filmed in settings that are surreal, comic or charged with elegiac sadness. Rosenfeldt films Blanchett as a devout looking housewife saying grace (Claes Oldenberg’s I Am for an Art) before her husband and children can eat dinner; as a rock ‘roll chick winding down after a gig in a sleazy club (the stridentism of Manual Maples Arce); a wealthy patron giving a speech at a chic opening (Wyndham Lewis and vorticism); a dictatorial opera director shouting out directions to a troupe of dancers (the Fluxus movement); or an old man walking through the ruins of an abandoned factory (Marx and Engels). Manifesto culminates on a cine-literate note when Blanchett as a primary school teacher delivers a series of polemics by the likes of Werner Herzog and the Lars von Trier-led Dogme 95 crowd to a classroom of earnest children obediently reciting key sections. Having demonstrated her acting chops as Elizabeth I and Bob Dylan, in his mid-60s electric period, to a divorcee on the brink of madness in Blue Jasmine and a closeted lesbian housewife in Carol, Manifesto is an opportunity to both consolidate and experiment with this chameleon-like gift for mimicry, disguise and transformation. Manifesto’s structure takes Blanchett’s gift for vocal delivery and near Method-like immersion in character to extremes. My personal favourite is when as a widow dressed in uber-chic black, she leads mourners and a brass band to a cemetery to deliver a near scatological tirade made up of Tristan Tzara and other Dadaists. For the most part, Manifesto is a well-paced, thought provoking and surprisingly funny film that mir-rors the provocative spirit of the texts it pays homage to. One could easily spend an eternity – time enough, at the very least, to write one’s own call to arms – deciding if the result is sufficiently “filmic” or better appreciated in a space like the Tate, Pompidou Centre or Museum of Modern Art. I felt a twinge of nostalgia while watching the film as it also reminded me of the “materialist” cinema in vogue in various film collectives in the 80s. It helps to keep an open mind watching this film as many of the texts are familiar only to specialists in a specific field. While Manifesto is beautiful to look at, more fidgety viewers are warned that it does not have any car chases or explosions set to the words of auto-destructionist Gustav Metzger (perhaps the sequel will contain such a scene). Much of your enjoyment or confusion will depend on your individual knowledge and cultural baggage in general. If you prefer the mischief making of a Herschell Lewis, Russ Meyer or John Waters, you might find this film more pretentious than provocative. Manifesto is almost critic proof – if you love it, it will probably because you are having as fun as Rosenfelt, Blanchett and the cast and crew. If you hate Manifesto, the film has also succeeded – no one ever brought about a revolution without a few casualties.